I managed to make another bee block for my Sew Sisters Quilting Bee! I’m behind, and I’m not even going in order at this point, but I’m happy to have made even this small amount of progress. 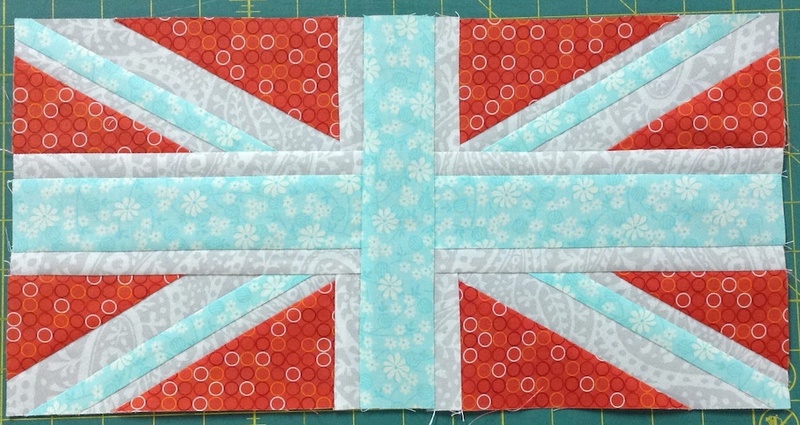 She chose the Union Jack block tutorial that you can find here on Molli Sparkles web site. 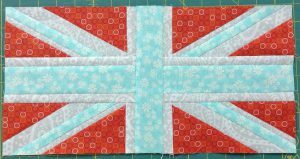 The tutorial is super easy to follow, and very well written, but you have to pay attention while you’re cutting and sewing, for this block to come out right. Mary is having some of them made with orange in the middle and blue in the outer areas, and some like the above, with the blue in the middle. Her quilt is going to be so neat — I can’t wait to see it! I made one for myself, too, since I’m making two of each block. Wonder if that has anything to do with why I’m behind on this bee? Oh, no, I’m sure that making two doesn’t affect things at all! After all, the second one is always faster! Great block, unusual.